The scramble recovery, sometimes referred to as the cowboy recovery because of straddling the kayak as you do a horse, is a great way to help you learn balance and allows you to really get to know your kayak. The concept is simple, climb on your kayak, get in and paddle off. It is one of those techniques worth having in your bag of tricks if you can do it. I have seen paddlers who have done this recovery in rough water and paddle off with a cockpit half filled with water. These paddlers are more of the exception than the rule. I have also seen others who have tried and tried with no success. It is also an equipment and body specific skill. It is very difficult to do with a small cockpit opening or if you have very long legs. However, I think it is worth knowing and practicing because it will help with your other recovery techniques. As with any technique there are pros and cons. I would not recommend this technique in very rough water with limited energy. 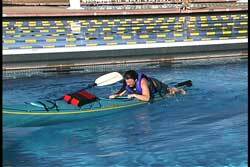 The chance of capsize is greater when doing this recovery, due to your higher center of gravity. In rough conditions or when fatigued, you always want to go to your "bread & butter" techniques. Those are the ones you can do all the time on the first try. If you do find yourself with no recovery equipment, this will be one of the techniques that may work for you, but you definitely have to practice this repeatedly in calm water before attempting it in rough conditions. 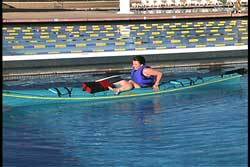 I like to do this technique with my hands free, so I recommend storing your paddle out of the way by placing it under your bungee cords, deck lines or use a paddle leash. When ready, move to the back hatch and launch yourself out of the water so you can get your body over the back deck with your navel toward the mid-line of the kayak. If there is a rudder you need to climb on closer to the cockpit. If there is no rudder, then you can get closer to the stern. I have seen some paddlers come directly over the stern, because their kayak design allowed them to do so. As you get closer to the stern it is usually easier to climb onto your deck, because that area will sink as you climb on. Once balanced over the back deck, turn your head toward the bow and throw your leg over the stern (be careful of the rudder) so you have one leg on each side of the kayak. 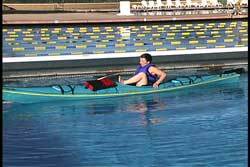 Keeping you legs spread out away from the kayak will provide you with the most balance throughout this entire skill. If you wrap your legs around the kayak you will feel a lot less stable. It is a tendency to wrap your legs the first few times you try this. Remember, spread out to get better balance. Some of the items that can make this technique a bit more challenging are your spray skirt, the gear on your back deck and the design of your hatch buckles. It is very common for your spray skirt to get caught under your body as you move along the deck. I once had my spray skirt get caught on the point of the stern and I couldn't even move toward the cockpit because I was fighting the elastic of my neoprene skirt. I had to get off and do it again. One of the common tricks for keeping the spray skirt from getting caught is putting the skirt tab in your teeth before you try moving forward on the deck. Your goal is to get yourself over you cockpit. Some do it lying down. I find it better and faster to do it sitting up (keeping my legs straight out to the sides). When I first sit up I pull my spray skirt out from under my body and put the grab loop in my teeth. 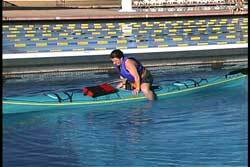 It is very common for the paddler to hug the kayak with their legs as they try to move up. It occurs more often as they feel they are losing their balance. Again, you have more stability if you keep your legs pointing out to the side. In order to be able to get into your seat efficiently you need to get your backside past your seatback. When you go past your seatback make sure it is upright and positioned properly. You do not want to sit down on the seatback if it is folded onto your seat. It is common to misjudge how far forward you need to be before you can sit in your seat. The first few times you will probably be too close to your seatback. Straddling the kayak gets more difficult as you get closer to the cockpit, which is usually the widest part of the kayak. It is also common to bruise the inner thigh area when you practice this. I often get comments from students after the class telling me about their bruises. Post class soreness is also common. The crux move of the entire skill is dropping your backside quickly into your seat. If you move slowly, it is common to lose your balance and flip over, because there is a balance shift that occurs. To quickly drop your backside into the seat you need to lift your knees up towards your chest. Your thighs are keeping you above the seat, because you are flaring them outward. You need to get the thighs up out of the way so you can drop into your seat. Lifting your knees up to your chest allows you to do so. After you are in your seat you will feel a lot more stable, because your center of gravity is lower. As you are lifting your knees you are beginning to lean back a small bit. You hands also move slightly back as you lean back and drop into the seat. When you feel comfortable, bring your legs in one at a time. Keep looking at the horizon for balance and you should be fine. The reason I call this a boat and body specific skill is because you need to be able to bring your feet into the cockpit while sitting in your seat. Since I am 6'7" tall with long legs, I cannot put my legs into the cockpit while I am sitting in my seat. I have to make a choice. Either I paddle off with my legs dangling out to the sides or I can try to put my legs in by lifting my body back off of the seat. When I try this my center of gravity raises and my stability decreases drastically. I have also tried doing an over the shoulder sculling high brace for stability while I sit on the deck behind my seat. While using my sculling brace, I then try to slip my legs in first and then I sit into the seat. The reason I use the over the shoulder sculling brace is because it leaves one hand free to help me slide into the seat. I freely admit that my success rate is such that I do not consider this a reliable technique. 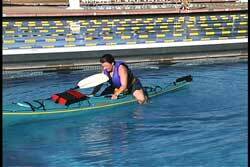 Now that you are in your kayak you need to decide if you will pump out the kayak or just paddle off. Your boat design, amount of water in the cockpit and skill level will make that determination. If you do choose to pump, keep in mind that you will need to balance while you pump, as the water sloshing around in the kayak can affect your balance. 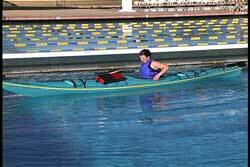 If you can perform one of the many kayak-draining techniques while in the water, then you can get into a fairly empty cockpit and not have to worry about pumping or paddling a tippy water laden kayak. Remember, you should to be dressed for immersion if you are going to take the time to drain the water. 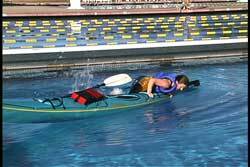 There are other ways of quickly getting into your kayak without help of floats or partners. One is from the side directly into your cockpit. Some have referred to this as a side scramble. See USK article, "Side Scramble Recovery." It is the same technique that SOT (Sit On Top) boaters use. See USK article, "Sit-On-Top BBF Recovery." As with any skill keep practicing until you know it. The scramble recovery is one that needs to be practiced often to keep you balance sharp. It is great if you can master it. If not, keep trying during practice sessions, because the balance and movements you are practicing are essential to most recovery techniques. Pictures seen above were taken from USK's "Capsize Recoveries & Rescue Procedures " video.